I did manage to go out and do my “late winter” pruning last weekend. The local rodents pruned the raspberry (and the mapleleaf viburnum, again) for me, but I chopped down all the Annabelle hydrangeas close to the ground. My friend the landscaper suggested that I also prune them in May by cutting all the outer stems in half so that they self-stake. Surfing around the garden blogosphere has reminded me that I should really order my seeds! Right now, only swiss chard and tat soi are on my list, but I’m sure there’s other hardy things I should be thinking about planting. The crocuses are up, and earlier than last year! There’s a couple of tiny scilla buds found in spots, but those probably won’t appear until April. 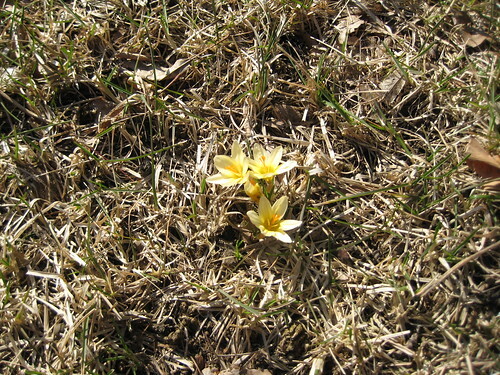 In the backyard, there are daffodil and hyacinth sprouts, so spring is definitely coming despite the harsh winter. We’ve gotten recurring waves of thunderstorms and cloudbursts this weekend, and the pond is higher than I’ve seen it before. 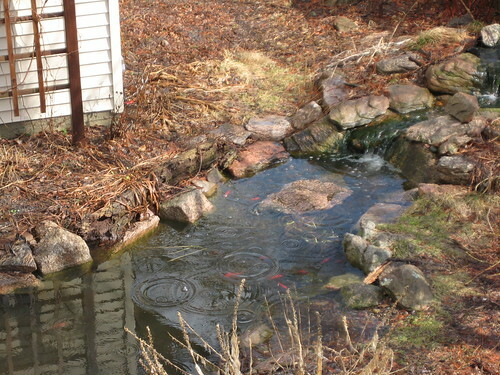 The stepping stone right below the biofalls is nearly submerged, and the rocks just to the right of the stepping stone at the edge of the pond are under an inch of water. At least the ground is partially thawed, so the overflow should start lowering the level slowly. At last check, we’ve gotten 3 inches of rain so far this weekend.